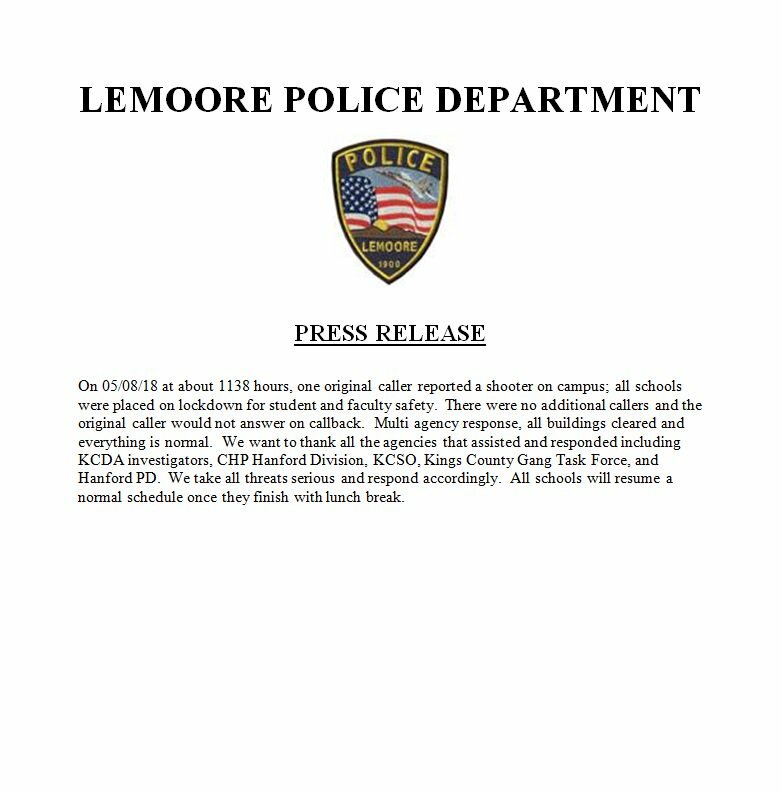 West Hills College students are reporting there is an active shooting at Lemoore West Hills College. There are reports of shots fired and police looking for the shooter. The Hanford police department, Lemoore police department, Fresno Sheriff’s Office and SWAT are currently on the scene investigating. At this time, there are no reports of any injuries and law enforcement has not found anything on campus. At this time, law enforcement is not reporting any shooter or injuries. The school is asking everyone on campus to take shelter in place and everyone away from campus to stay away. “Security Alert at West Hills College Lemoore. The campus has been locked down. Hold shelter in place. Lock doors/windows. Await further info. Hanford PD, Lemoore PD and Fresno Sheriff is on campus. Please stay in locked buildings until released by police. If you are not on campus, do not come on campus. Keep doors and windows locked. Await further info,” the college said on its website. West Hills College-Lemoore is a public two-year community college built in 2002 and serving students in the San Joaquin Valley. The lockdown at Lenmoore West Hills College is just the latest in a string of threats, lockdowns, and shootings that have plagued the United States. Over the course of the past few years, shootings such as these have been a scourge upon the country and people have struggled with coming up with a solution. Lockdowns have become all too common as a means of protection when students and faculty are in danger and today is no different. This lockdown follows incidents at Dodd Middle School in Connecticut, Windham Public Schools also in Connecticut, Pacoima Middle School in Los Angeles, Millennium Middle School in Florida, and US Grant High School in Oklahoma, which are just some of the places where events such as this have occurred. West Hills College Lemoore is part of West Hills Community College District. In addition, classes are offered at Lemoore Naval Air Station. Classes from California State University – Fresno are videoconferenced in the campus and Fresno Pacific University offers two bachelor’s degree programs on the campus. West Hills College Lemoore offers soccer, golf and cross country for both men and women, basketball for women, and wrestling for men. The school is accredited by the Western Association of Schools and Colleges.